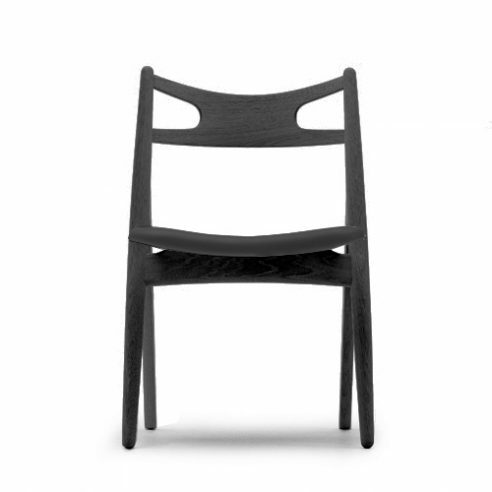 The black version of Hans J. Wegner’s Sawhorse Chair is upholstered in black Loke leather with a black lacquered oak frame. The Sawhorse was a theme Wegner was fond of using in both his table- and chair production. But it must also have been a concept quite native to him, since it is so readily associated with woodworking. Among his sawhorse furniture, CH29, simply called the Sawhorse Chair, turned out to have the greatest impact and achieved the status of a classic. When it was introduced, the press praised the chair with words like ‘triumph’ and ‘the admirably designed, light dining room chair’. In addition to the qualities mentioned in the press, it pleased Wegner how comfortable the chair was, plus the fact that it was light enough to be handled easily by a housewife. words, Wegner made a point of reducing the amount of wood and chair parts while maintaining great sitting comfort. The Sawhorse Chair was not designed for the Cabinetmaker Guild exhibitions, but for Carl Hansen & Son. This meant Wegner had to model the chair in a way that suited a production procedure to a greater degree than he otherwise would have. Thus the simple lines and reduction of the number of components served as an optimal design solution for this modern piece of furniture. Wegner had designed the dining room chair, CH23, in 1950 for Carl Hansen & Son, along with its matching easy chair, CH25. The Sawhorse Chair, too, made up half of a dining and easychair duo. The easychair version of the Sawhorse, designed in 1951, was given product number CH28 and went into production the same year. The dining room chair was also designed in 1951, but only went into production the following year, after a thorough testing procedure. As part of a photo portrait series from December 1951 in the newspaper, Politiken, there is a picture of the Wegner’s housemaid sitting in the Sawhorse Chair. The text reads: ‘By the time Hans J. Wegner sends a chair out into the world, he has tested it thoroughly and for a long time.’ This is a clear example of the fact that Wegner’s chairs were not just supposed to function well on paper, but also in practice. Both variants of the Sawhorse Chair were produced with a bare plywood seat as well as an upholstered one. The Sawhorse Chair bore a strong likeness to – and was a clear forerunner of – both the Folding Chair and the fixed version of Politiken’s canteen chair that Wegner designed in the 1980s with a seat that came in a variety of colours.